Aleeza Yu, a Canadian-born Chinese gymnast and four-year honor roll student from a public high school in Canada, has been awarded a full athletic scholarship to study at the prestigious Stanford University in the United States. It was not easy to compete for a full scholarship offered by such a renowned member university of the National Collegiate Athletic Association (NCAA). The NCAA has some 1,100 member colleges and universities that support student-athletes across over 20 sports. Competition for its scholarships, open to applicants from around the world, is quite profound. Stanford University has an admission rate of only 4.7 percent this year. Aleeza, the daughter of an immigrant family from Hong Kong, admitted that gymnastics had given her a good opportunity to attend a good university. When she was only 4 or 5 years old, Aleeza told her mother, Sheree Yu, that she wanted to learn gymnastics. Sheree knew little about gymnastics at the time and at first was not very supportive, thinking that it would be very hard for her daughter. To help fulfill her daughter’s dream, Sheree enrolled her in what was regarded as the best gymnastics club in their area. It was located in Oshawa, where Aleeza’s father ran a physical therapy clinic, and it was tens of kilometres away from their home. Aleeza’s gift was quickly recognized by the local education department, which helped her find a public school in Oshawa that welcomed gifted students. At 9, Aleeza joined the Ontario provincial team, won first prize in the all-around East Coast competition in Canada, and was a member of the Ontario champion team. At 11, Aleeza entered the national level and competed in international games in subsequent years worldwide. 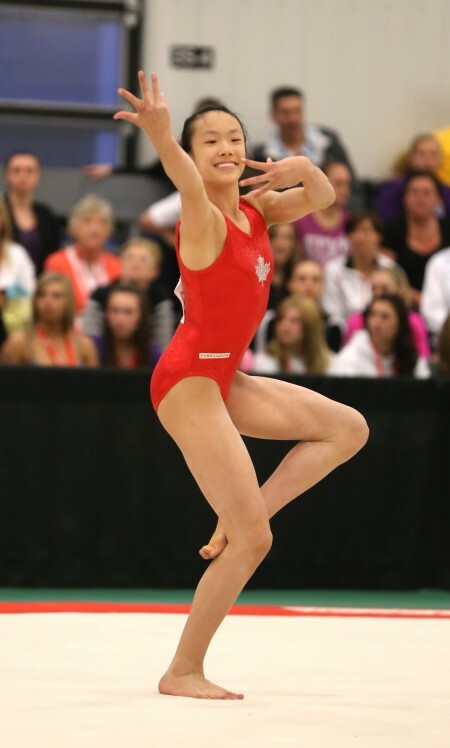 In April 2014, she was a member of the Canadian senior national team, which won a team silver medal at the Pacific Rim competition, and added to her list of awards an individual bronze on the floor exercise. Aleeza began her packed daily schedule from 6:30 a.m. to 10 p.m. starting in grade 3. She took time off from one lesson each afternoon for her gymnastics training, which would end between 7 p.m. and 9 p.m. On weekends, she had piano and Chinese dance lessons and has passed her grade 8 piano examination. Over the past decade, while training to be a top national gymnast, Aleeza never neglected her studies, scoring 90 or above in all her subjects in high school. She caught up on the missing lessons mostly through personal online study. Other than music and dance, Aleeza is also fond of reading, watching movies, cycling, and is interested in discussing current affairs as well as celebrity news with her peers. Realizing that the average career lifespan of a gymnast is around 20 years, and that many retire after graduating from college, Aleeza knew that it was necessary to give serious consideration to a college education. Both her school curriculum and gymnastics training became more demanding in grade 11, especially since the international competitions Aleeza was taking part in had higher technique requirements while she was also in the midst of preparing for college applications that called for very good results. Aleeza had to choose between her favorite activity, gymnastics, which she knew very well was not a lifetime career, and the mounting study pressure. At this time it was due to Sheree’s encouragement that Aleeza decided to pursue a college education at Stanford and continue her path in gymnastics at the same time. Though ranked in the top 5 in Canadian gymnastics, this would normally be insufficient to get her a scholarship to Stanford University without her hard work and dedication. “I chose Stanford because I knew that Stanford would not only provide me with the chance to pursue my academic and athletic goals, but also challenge me to open up to more opportunities beyond what I could ever imagine,” said Aleeza on the Stanford website. She chose to study for a linguistics degree in speech therapy, hoping to be able to help those with speech barriers. School work was not tedious for Aleeza, and she found it less arduous than the tough gymnastics training, which goes along with hardship, anxiety, and injuries during competition. Aleeza has had numerous injuries including ligament sprains and fractures. “These are serious tests for the body and mind. For instance, when you return to compete after a recovery, you have to redo the stunts that caused your injury, and that is a big test,” she said. Aleeza’s whole family practices Falun Dafa, a traditional Chinese spiritual and meditation discipline of the Buddha School based on the tenets of Zhen-Shan-Ren (Truthfulness, Compassion, and Forbearance). Aleeza said that her cultivation in Falun Dafa helped her to be better able to deal with challenges of all kinds. Sheree, her mother, found that Aleeza was more mature than the average child. For instance, she was very capable taking care of herself on a trip to Japan with her coach for a competition in grade 9. “I like to be independent. … I look at challenges from a different point of view. When I encounter difficulties or interpersonal conflicts, I look at them from a positive perspective. This can help me get over things quickly,” said Aleeza. Aleeza fell off the balance beam in a competition two years ago, and while friends worried for her, she was unaffected during the subsequent floor exercise. “I only thought about how to do my best in the rest of the competition. I didn’t look back, but simply looked forward,” said Aleeza. Aleeza participated in the national tournament in Ottawa in 2014 for the July Commonwealth Games in the U.K., even though she had a foot injury. Unfortunately, she added a new injury during the competition. “The first day I ranked 2nd in the all-around but was injured again during the vault session,” said Aleeza. Why participate with an injury? “I understand that I need to cooperate with the team, respect my coach’s decision, and try my best,” she said.